Would you like to create a video slider and autoplay video slides? You can easily do this with Soliloquy. We’ll walk you through the steps on how to set up your video slider and autoplay the videos! Your first step is to create a new slider or edit an existing one. 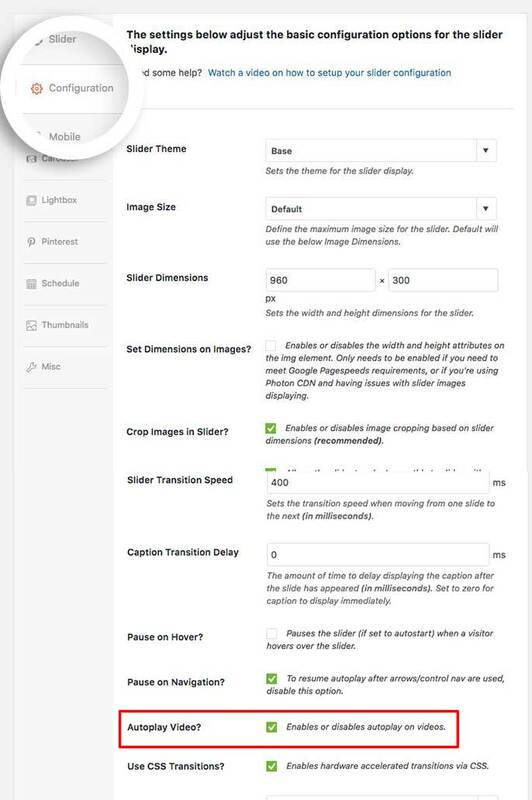 You can follow along with our documentation for creating your first slider. If you need any help in adding videos to your slider, please review this documentation. Once you’ve added your videos to your slider, you can then enable the autoplay for the video slides. Click on the Configuration tab, scroll down to check the box to Autoplay Video? Finally, click Publish or Update on your slider to save the changes. And that’s it! You’ve now enabled autoplay on your video slides! Would you like to have the videos play in the lightbox? With Soliloquy’s Lightbox Addon you can easily enable a lightbox for your slider images and videos. Take a look at our documentation on how to use the Lightbox Addon.